Meathead Movers is here to take care of the heavy lifting for you on your move to Novato. Our clean-cut student athlete movers are ready to get you safely settled into your new Novato home. Welcome to Meathead Movers of Novato! If you are moving to or from anywhere in Novato, we are the moving company for you! Our professionally trained student-athlete movers and our moving concierge service are here to help you with every stage of your move in Novato. Novato is a family-oriented community, that is dedicated to being a warm and welcoming city. With its mix of both small and large-scale companies, Novato is a great place to do business. Novato expands over 28 square miles and has a relatively small population of 53,000, giving the city a welcoming rural atmosphere. The city has over 3,600 acres of open space making it a haven for nature lovers and outdoor adventurers. If you want to experience fantastic new heights, a climb up Mt. Burdell will provide you thrilling new views. Novato also has two golf courses, a skate park, Stafford Lake Park, and 27 beautiful parks. To get to know Novato’s culture, stop by any of Novato’s traditional community events such as the Novato Festival of Art, Wine and Music, the 4th of July Parade, Nostalgia Days Classic Car Show, Farmers’ Markets, and their Holiday Tree Lighting. Residents and visitors should also check out the Marin Museum of the American Indian and Olompali State Park to learn more about Novato’s rich Native American history. 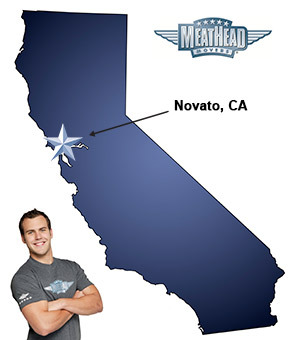 If you are considering a move to Novato, Meathead Movers is here to help! Our moving company specializes in local, long-distance, and commercial moves to, from, and within Novato. We also provide reliable packing, storage, on-site relocations, and our distinctive moving concierge service. All our student-athlete movers are thoroughly screened and trained before their very first move. With branches not just in Novato, but all throughout California, we are your one stop resource for all your moving needs, no matter where your California move takes you. In fact, you can see what your neighbors in Novato have to say about us. With our 100% satisfaction guarantee, the only thing you have to lose is the stress that comes from moving! So contact us today for a free moving quote and to learn how we can help you on your next move! Moving to Novato? Here are some helpful resources.